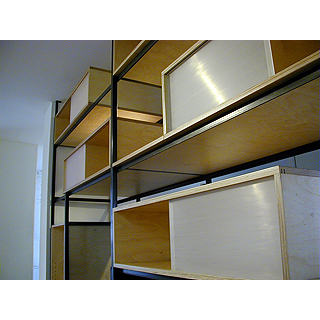 An extremely small studio apartment was reorganized through the insertion of our so-called Superwall - a room divider, desk, headboard, bookshelf, Display case and night stand. For rapid installation and economy, the construction consisted of shop prepared clear-coated plywood boxes and open shelves, which slide into a ladder system of blackened steel tubes. + L-angles, fixed only to floor + ceiling. The desk depth of the entire unit allowed for double depth book shelves. Openings between boxes and the frames allow for light to pass from the Bedroom windows into the main living area.